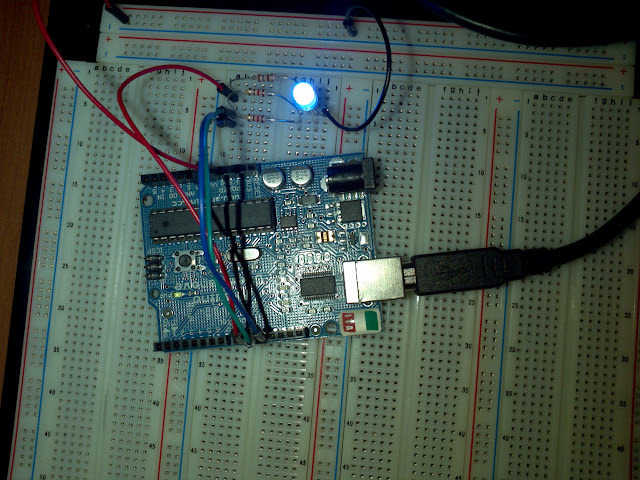 Why buy a one color LED when you can have an LED that makes all the colors, that’s what Red Green Blue LEDs are for and in this tutorial I will show you how to use them with your Arduino. The RGB LED I will be using was one that I bought from Sparkfun. I got the diffused one because the clear ones are too bright. The LED has four pins, the longest pin is ground. The others are the colors red green and blue, I used wires in my circuit with the same color as the pins they are connected too so I think you can figure out the pin out from the circuit or datasheet. The resistors I used were 180 for red and 120 for green and blue. 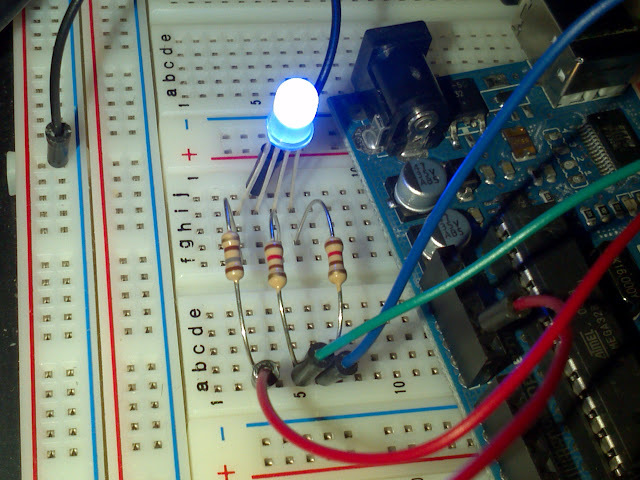 Don’t use values less than this or you will burn your LED ( you can use 100 for green and blue but red must be 180). From the left, pins 1,2, 3 and 4 are red, ground, green and blue respectively. The colors red, green and blue are connected to the PWM pins 9, 10 and 11 respectively. 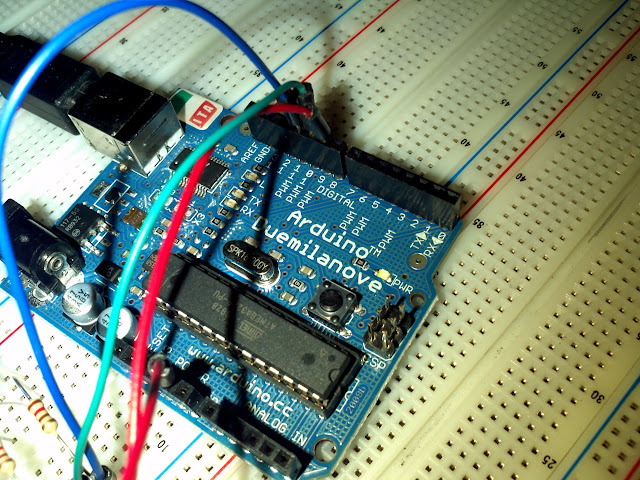 The other red wire is connected from a ground pin in the Arduino to the ground line in my breadboard. Top three wires, red, green and blue connected to pins 9, 10 and 11 respectively. The red wire below is connected to a groun pin. We could use digital outputs, but that would be pretty boring because you wouldn’t be able to get shades of colors that way so let’s use PWM for analog output. Let’s write three programs in one. For what I have in mind we’ll need the following set up. You should see the colors red, green and blue turn on and off in that order. Let’s take advantage of the fact that our color pins are numbered one after the other, that is from 9 to 11 and dim each of the colors in and out. Now let's increase the brightness of each of the colors, as before, but let's not turn them off so that they overlap. As expected you will get a white LED. Now let's put them all together. Also check out the video below to see the result.